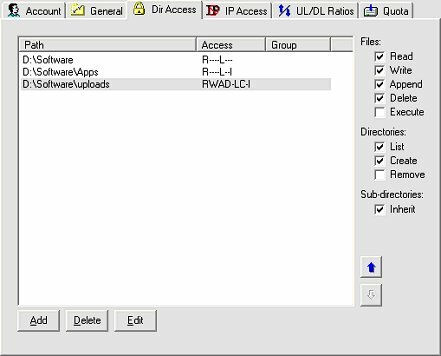 Creating directory access rules and permissions. You need to set the permissions for each user. However, we do want the user to be able to upload new files to the uploads section. Read checked (lets user download files) Write checked (lets user upload files) Append checked (lets user add to a file - needed to continue a d/connected upload) Delete checked (allows user to amend or delete a file) Execute leave blank I do not recommend you let any user have this permission, as it means that they could execute or run a programme on your pc. List Checked Allows user to list the directories Create Checked Allows user to create a new directory or subfolder. Remove Unchecked This is up to you, but means a user could delete a folder. Finally check the Inherit box so that the rules apply to all folders beneath this one. See next page for Configuring Serve-U for a NAT router.